Dr. Eckhard Besuden, artist from the Konstanz area is today's interview partner of Dr. Barbara Aust-Wegemund. Within half a year a short contact in November 2013 developed into an intensive dialogue between the art historian and the artist. Dr. Barbara Aust-Wegemund, owner of 'Art History Consulting' (AHC) is independent curator and art journalist. She publishes among others for the department „Art in Germany“ in the 'Goethe Institut Inter Nationes'. AHC: Dear Dr. Besuden, you see yourself as a representative of anti determinism. What precisely do you mean by that? We can omit the 'Dr.'. That belongs to my other world, my career as a lawyer. I don't feel unwell as a schizophrenic. As an artist I am an absolute dilettante and surely without any academic knowledge – as a lawyer it's the other way around. But today I am not here as a lawyer. Antideterminism – that's a long story. I will try to cut it short (laughs). Let us focus on the supreme art discipline, painting and especially modern painting. Antideterminism shall lead to a condition where the observer can fully concentrate on the mere power of painting. No rules, no tricks no history – art frees your mind. AHC: Good Mr. Besuden. But when talking about Antideterminism we should also mention Determinism. Determinism is the predictable determination of the requirements of the 1st art market concerning the results of art. Let us make a critical point in not assuming that art is mere self reflection as Baudrillard meant it. Determinism as art dogmatic phenomenon is based on the following question: “What is the painter’s requirement concerning modern art?” Is it the question about 'life, the universe and everything', if I may quote Douglas Adams. No, it is the most important question for every ambitious painter and the art dogmatic answer is not „42“. I think the beginnings of Determinism can be traced from Impressionism on. The first one to exploit the pecuniary power of the dogmatic art against the then salon painting (which worked according to the principle “I think it’s beautiful”) was in my opinion Paul Durand-Ruel. He was the one who demanded the deterministic features for modern art from his artist pupils. AHC: Which features did Paul Durand-Ruel expect from his pupils? It has to be „new“– you may not paint anything, that already exists. It must be „authentic“– it must be you who is immediately recognized as the painter. It must be „technically perfect“– what else. It may not be „decorative“ – serious art is not decorative, it doesn’t fit among the living room set. The essential objective of Durand-Ruel’s distinction between determinism and salon painting was ultimately „just to make money“. The feature of being new unintendedly created anti decoration. ‚New‘ means not compatible with the prevailing taste. But obviously he incidentally created the prevailing art dogmatic marketing instrument until well into the nineteen sixties – the scandal as a purchase catalyst that can’t be ignored to this day among the rather weak minded art collectors – and the admittedly few infantile curators. There was also his wish to offer his customers a unique CV of his painters. They should have a merely artists CV like Gauguin has already exercised it for the artists community. First he was a stockbroker and then giving up his bourgeois existence a penniless painter. AHC: Which meaning did a merely artistic or merely academic CV have? The feature of the merely artistic CV developed in the sixties into a feature with the main task to exclude painting lawyers like myself or panting banker’s wives who in the majority in those years either opened a shoe shop or started painting. The feature of ‘shortage’ was born. Rolex has recognized the phenomenon already in 1926 with the campaign for the ‚Oyster‘. The company reduced its points of sale to the least. If you want to transport the message to the customer that he acquires something special and that it’s a good investment, you have to convince him that not everybody is entitled to paint it even if he or she actually has painted it. The „merely artistic CV“ deliberately excludes 99% of the painters from the art market. Only 1% of all painters are worthy to sell their art on the 1st art market, and we are talking about marketing strategies still in existence to this day. The features „new“, „authentic“, „pure CV“, „anti decorative“, „technically perfect“ open the wallet of every collector, curator at once and make him intoxicated with joy. He feels like a selected participator in a market with an extreme shortage of resources. AHC: In 2007 the ‚Transitory Gallery London‘ provoked with the slogan “we need more Dilettantes”. Was that a breakthrough? 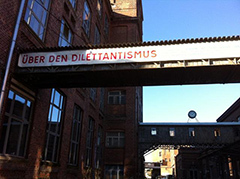 The antideterminists like myself from 2000 on or the ‚Transition Gallery‘ in London from 2007 on with the slogan „we need more dilettantes“ and from 2012 on in the ‘Baumwollspinnerei’ in Leipzig with the motto „On dilettantism“. try art dogmatically the exact opposite. I think the art world can’t be moved by new paintings anymore. New dogmatic ideas are required – and they must be radical. These ideas open the 1st art market to painting lawyers and to shoe selling banker’s wives – but they also put these people to the test – the artistic power of their works has to pass this test. AHC: How does a dilettante paint? How do I have to paint? 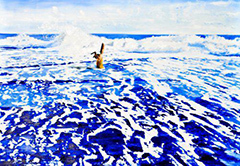 We don’t paint in a new, authentic or antidecorative way or equipped with a merely artistic CV. We copy, we paint what has already been painted, and we paint in a decorative way and with a total arbitrariness of the subjects. Only the feature of “perfect technique” can’t be ignored by anyone because in the end the result must pass the test in comparison with the painted object. Art dogmatically this sets us back at least three hundred years. But it frees the act of painting from knowledge and from prejudices in the head of the painter. The most important thing when working as an artist is the painting itself. The sentence of Goethe „one sees only what one knows “ must be rethought and rephrased into „one knows only what one sees“. If we recognize that we have been subject to a marketing strategy for approximately 100 years, then we look forward to buying something that in spite of the legitimate accusation of having previously existed or of arbitrariness in spite of the known performance, anyway is something dogmatically new. AHC: So it is your goal to undermine the marketing mechanisms? The painting emphasizes our „new“ knowledge that in the 21st century we don’t want to be patronized by marketing mechanisms when buying a painting. We rather go back to relying on our intuition and not on our consultants, whom we suspect of consulting under mere marketing aspects. Those who don’t have the slightest idea of art dogmatic won’t buy antideterminist paintings because there are no books about antideterminism in the shelves of the book stores. These paintings are arbitrary, they have been painted before, and they are old. But to those who have knowledge the words come without effort (Seneca). If a collector understands that we don’t paint deterministic the subject moves into the background. Antideterminism can only be proven by the oeuvre of the artist. So it is not just a painting but the artist has to prove that he has the power to create art and not just to act favorable in terms of market strategy. That should be left to the gallery owners, curators and the other protagonists of the 1st art market. As a painter one needs to be thick skinned. AHC: You live in two worlds – the world of paragraphs (as a lawyer in a solicitor’s office) and in the world of art? Do these worlds inspire one another? Or do they sometimes stand in each other’s way? Originally there were a lot of universes in my life, if we for once don’t take the family into account. Physics, chess, art, music and later on law. For physics I proved to be too inexperienced, not even equipped with the bare necessities. For music I didn’t have the necessary time. Horowitz once said: ‘If I don’t practice for two days, I hear it, if I don’t practice for a week, my wife hears it, and if I don’t practice for a month the entire world hears it. An instrument doesn’t forgive. Painting, chess and law do, not unlike riding a bike. The remaining worlds have one thing in common: If you think one move deeper than your opponent you will be better than him in the end and everyone will see it because you can’t cheat intuition. So the argument of arbitrariness in art is a superficial one. Every moron can see if you can’t paint. The emperor just doesn’t wear any clothes. AHC: When did it become clear to you that you want to become an artist? I wanted to become a painter at the age of six, a chess player with 12 years. After school I applied for physics, medicine, art, aerospace technology, theater science, informatics and industrial design. Unfortunately my application at the ‚Hochschule der Künste‘ in with drawings was a disaster. I wasn’t even invited for an interview – a straight f student. It took me many years to get over with it, studied informatics without success, applied again for aerospace technology and came back to law where I found what I am really good at. You don’t have to be super intelligent, diligence beats genius. Additionally to the allowance my parents paid me I worked in the cleaning squad of the University of Konstanz and made much money with cleaning. My first girl friend in Konstanz I met in the ladies‘ room. She recognized me as a freshman and yelled „ihhh, what are you doin‘ here?“ I answered: “I work here.” Obviously it didn’t have any deterrent effect. AHC: You worked hard to earn some additional money to the allowance of your parents. That surely wasn’t easy. This reminds me of Lüpertz who worked as a night watch and as a construction worker during the day. Was that a school for life? Did you learn anything from it? In this phase I learned something my home environment couldn’t teach me. 90% of the protagonists are underpaid, some of them will cheat you, simply to improve their living standard. Others will become real friends, even if they have cheated on you before. AHC: Art, legal studies, side – an ambitious undertaking. Obviously you are very motivated? I wanted to become an artist at the age of six, but also radio astronomer, steam locomotive driver, physicist, engineer, actor and so on. During my studies I thoroughly read mountains of books about painting techniques, my grades in legal studies became so bad that they earned me the nickname „Ecki Mahmoudi – Not without my exam“. But I got my act together in time. I learned that with above average diligence you can become what remains with extraordinary capabilities. Get absorbed in it. Maybe the motivational result makes you more perfect. AHC: Was there a point when you began to doubt. As is known the genius struggles with himself. Since I’m not a genius I never struggled – especially not with myself. Of course there are moments when I love the sentence of Bruno Ganz: “Do I have to remember everything by myself?” My main problem with antideterminism is the accusation of arbitrariness. I can only avoid it with the knowledge of the observer. But he should be really talented. He has to know the circumstances. Otherwise he is – I am – lost. That’s why the first art market is taboo for me. This market doesn’t work with the aforementioned approach. Sometimes that makes me very sad. Why shouldn’t I paint something “new” in “my authentic style”, skip my job as a lawyer and indulge in other features of the marketing strategy? No, don’t worry – I will go on painting nonsense the first art market will only tolerate when it’s placed above the escalator in the supermarket. AHC: There is no accounting for taste – or art. Can you describe what good art is for you? Uh, that is difficult. Like everybody else I first reacted Pavlovian. The linear art dogmatics lead broadly speaking from impressionism via Art Nouveau, Postimpressionism, beginning of Modern art, Fauvism, Expressionism, Dada, Bauhaus. This is all history and doesn’t interest me at all in terms of art. Then it becomes extremely complex even when focusing on German art only. Let’s take the unbelievable photographs from Richard Peter of the Semperoper of 1945 or Peter Heldt. I love the paper abstractions by Fritz Winter emulating cubism while simultaneously ‘translating’ it into German. Already in 1948 Rupprecht Geiger paints like the later Gerhard Richter. Willi Baumeister is not my cup of tea – determinism – too result oriented. Then the documentas begin. AHC: How do you see art after 1945? In the nineteen sixties everybody was painting somehow extremely abstractly, which strikes me as extremely boring, like every fashion trend. The works of Georg Meistermann are almost copies of Picasso’s cubistic phase, works of Emil Schumacher are the early compositions of Nolde. In the nineteen sixties I think Georg Meistermann and Rupprecht Geiger have their justification. Faßbender on the other hand is too Kirchner-like for me and the same goes for Sonderberg and Götz. From Bernard Schultze decades later Peter Kuckei was obviously inspired – both of them are highly interesting. I think Nay is already totally obsolete at that time – when thinking determinalistically – but absolutely beautiful. AHC: Post-war-Germany was characterized by reconstruction, wealth, but likewise by protests. Is there a revival of the scandal in art? Which concepts do you find appealing? In the late nineteen sixties the paintings of Günther Uecker and Heinz Mack are appealing. But I miss the power of painting. I think the German Idealists like Winfred Gaul, Kuno Gonschior etc. are extremely boring. The attempted to include photography into painting was bound to fail, which they should have known. In the late nineteen sixties with Paik, Leve and Maciunas everything distances itself from my taste anyway. Even a divinely gifted technician like Gerhard Richter paints very poorly during this phase. It is the era of Beuys, who to top it all revives the long dead scandal. From the perspective of painting they are all completely uninteresting, but very contemporary nonetheless. It’s like Warhol. His art is grotesquely simple. But he totally reflected the zeitgeist. A minimum of effort combined with dogmatic deterministic pomp and ceremony (“paint mass art in the factory” – yeah, like that’s really new…) brings immediate absolute salability. We are sooo surprised. Wolf Vostell imitates Warhol’s paintings and thinks he is worth being exhibited. Let’s look at the ‘quiet ones’ like Horst Antes. Even his proximity to the cubistic Picassos can’t lessen his intrinsic value. Konrad Klapheck is without a doubt a genius. In comparison with Immendorf, it becomes crystal clear who takes the lead. Then there are the hotshots like Baselitz, Schönebeck, Lüpertz and of course the early Richter. It’s their achievement to have reanimated art after the dark post-Boys ages. The scandal is finally buried. They were without a doubt the defibrillator of painting, because I agree to Beuys’ thesis „Painting is dead“ to this extend. But art dogmatically they lead to a paradox. AHC: Is it contemporary to put artistic concepts into pigeon holes? A phenomenon like Richter is not explicable in the linear appreciation of art, where one thing leads to another. But dogmatics found a way in the nineteen eighties. Instead of a linear understanding of art there is now the cyclic understanding of art of the „Neuen“ Wilden, Neo Rauch is a „Neo“ surrealist, Romero Britto makes „Neo“ popart and so on. The world of art dogmatics was saved. We simply put a „Neo“ in front of everything and start again in the linear cycle. Dear buyers come and buy the neo impressionist, for they are so damned new, you know (laughs). The trick with the cyclic appreciation of art is of course dogmatically incorrect. The antideterminism is dogmatically overdue. AHC: Also if many things have existed already so the art of the seventies and eighties is in for surprises, isn’t it? In the 70ies I like Hartwig Ebersbach. Max Uhligs ‘Elbetreibholz’ is unbelievably beautiful. Before I start boring you, I think Graubner is just sensational. Technically his paintings are so demanding because they combine the frame-cushion technique with a combination of oil and acrylic paint. To be honest – I copied this idea from him – not the cushion of course for that would be too simple – but the mixture of acrylic paint and oil. Generally this period is interesting for my works. Here Dieter Krieg, Gerhard Richter, Palermo are influential. One could think that Palermo has absolutely nothing to do with my paintings. But look at the prototypes or ‘Coney Island‘. After Warhol’s „Six Self-portraits“ allowed me the reduplication I tried to reflect Palermo’s purity of color in series like the Seehas. I can’t do anything with the 80ies from Baselitz to Kiefer. That is all much too forced, it jumps you screaming: „HALLO – I AM ART– BUY ME, YOU SILLY RICH IDIOT, BUY ME NOW, BELIEVE ME, I JUST WANT YOUR BEST, YOUR MONEY!“ – Too obvious for my taste, also if it’s intended to look complicated. AHC: The hype on the art market of the 80ies has lead to commercial distortions. Which potential does art have today? Here I admire Volker Tannert and Peter Kuckei – modest but highly valuable. I like the modest ones better, like Hubertus Giebe or Walter Libuda, even if the latter ‚borrowed‘ extensively from James Ensor. Modesty is the last virtue we learn in this live – but some never learn it. The „Neuen Wilden“ are something to the satisfaction of the then money flooded American market – simple, super fast to paint, simply inspired by the 20ies of the last century, standard bearers of the cyclic appreciation of art. But then it finally goes off in the 90ies. 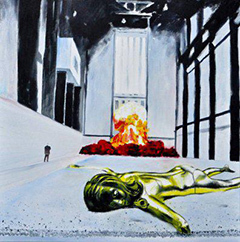 Neo Rauch and the ‚Leipziger Schule‘. I think that isn’t „neo“ surrealism but a secret code dodging dogmatics – brilliant yet condemned to eke out an existence as „neorealism“. Of the current artists – let’s say from 2010 on I like especially Hagen Betzwieser, Anna Gierster, Karl Hans Janke, Per Olaf Schmidt, none of whom have yet exploited their potential. No, on closer inspection – I love them all. AHC: But you don’t want to determine preferences? If I had such preferences I wouldn’t be an artist and by far no antideterminist. One has to know a lot, but shall not prefer anything, and one is not to be lured into one direction. Modes blur the hunger, they make it easy to unidirect ones enthusiasm to the new. The desire is just directed to the next season. That is primitive. Painters – like lawyers – should be clear, emotionless, objective and if possible diligent. AHC: It is your concept to strive for the biggest possible freedom in art. How do you achieve that? How do you burst the chains the art market ties the art with? A gallery owner in Moscow once said to me: „Eckhard, if you can paint forty of these pictures form e in the same style I will make us both rich.“ I almost couldn’t resist the temptation and thought: ‚one hast o remain polite.’ Yes, maybe but then my art remains poor. As long as I can fill my fridge I don’t need anyone – especially not anyone who tells me what to paint. I hate rules – old lawyer’s habit. But I love hints and since I am a stupid not trained dilettante I need input from experts who have learned it. Therefore I almost beg all the professionals around me for hints. Sometimes they react a little tensely but in general they condescend to a giving a lesson of their experience. I hoover that. But it doesn’t free me from thinking by myself. AHC: Is there an art work in your life that has impressed you in a special way? Or a painter whose life and work serve as a role model for you? No. There are too many of them. I just admire the diversity. In the universe of chess there are some favorite chess openings but – honestly – only because as a mortal one hasn’t the time to master also the rest of them. And yet, we wouldn’t start learning chess if we wouldn’t expect the game to be a real universe we will never be able wrap our head around. It would be a stupid form of the game to call e.g. nimzo-indian ones favorite. AHC: How do your paintings develop? Do you plan your compositions exactly? Do you make sketches or preliminary drafts or does the painting develop intuitively and spontaneously on the canvas? There are two possibilities. Let’s start with the concrete paintings: I start with sketches. If my children or my wife reject them they are lapsed – mostly. If they can be improved I look for photo templates with my camera and compose the picture in Adobe Photoshop which sometimes takes more time than the painting itself. Since the teacher of Monet and Renoir, Mr. Eugene Delacroix taught them 1863 that it is adequate to paint from a photo, ‘color by numbers’ is legalized. I read that only when I was 11 years old. Until then I thought that Modern art is realized free-handed. In Photoshop I already see if it is worth painting or if it will vanish in the nirvana of my hard drive. If it passes all tests I get started. One should think that it’s ‚color by numbers‘. But reality shows that in quasi 100% of the cases the template can’t be recognized afterwards. The painting process is something that overwhelms you, just like a game of chess where the opening is planned meticulously but becomes a total battle during the middle game. The second possibility lies in the abstract paintings. Those I just paint without prior planning. AHC: How do we have to imagine your artistic work day? Due to my profession as a lawyer I paint normally between 8 pm and 5 am so I don’t disturb my family. I’m lucky to need only a little sleep – usually. AHC: Which constraints, trends and clichés come to your mind spontaneously to describe the modern art world? On this topic there is no better book than Stefan Heidenreichs „Was verspricht die Kunst“ („What does Art promise“) from 1998. In 2007Stefanie Lucci throws here empiric dissertation „Um die Ecke denken“ („think around corners) into the ring, where she analyzes the quality features of modern art. She reflects determinism, maybe without knowing what exactly she found dogmatic – on the other hand this excellent work doesn’t look for reasons for dogmatics. In 2009 Dirk Boll defines determinism with his book „Kunst ist käuflich“ („art is for sale“). Art dogmatics hasn’t developed that far – why should it be any different with painting? That is very encouraging. AHC: Your favour for linguistic games is known. 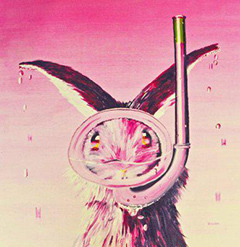 But how did you conceive the idea of the Lake Rabbit, displayed on the canvas as a rabbit with diving goggles? The discovery of Adobe Photoshop I owe to Hannes Krutzler. He had the idea of the rabbit putting on the diving goggles. When I came to Konstanz, I was told about the mystical figure of the ‘Seehas’ who commits his monstrous deeds in the Bodensee. After him the train connection is named that takes me to work every morning, the „Seehas“. One morning I remembered Hannes’ subject. Equipped with my local knowledge of the history of Konstanz I decided that it had to be painted. Initially it was a simple picture, as simple thought with the intense color of Warhol’s „Self-portraits“, but with every painted version of the ‘Seehas’ it became better and distanced itself from Hannes’ template. Sometimes it’s the simple things that we become addicted to. AHC: Are there other paintings in your work that you consider being – as Neo Rauch puts it – key paintings? Hard to say. 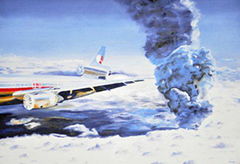 I’m just the cause – I don’t know the effect, may be the symbolistic ones. The „Strandrätsel“ (“beach riddle”)? An Italian gallery owner provoked me by saying „Seestücke, that isn’t art anymore after Gerhard Richter“. So I immediately painted a beach landscape where you can see three flags. Before the flags the word „no“ is written into the sand and the flags mean “A”, “R” and “T” according to the flag alphabet with an exclamation mark in the sand after them - „!“. 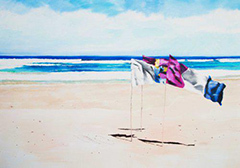 „NO ART!“, you know – but only for those who know the flag alphabet – and the gallery owner didn’t (grins). „Tate Modern“? In the Cathedral of deterministic art the „Tate Modern“ art lies as a golden, thus valuable, desirable model, but unfortunately dead on Weiweis sunflower seeds. In the background the antideterminism explodes that the knowing audience nonetheless turns towards, risking to lose its whole artistic worldview. They underestimate the danger that leads to art dogmatic emptiness and loneliness. AHC: Neo Rauch referred to his „Sucher“ („seeker“) as a key painting. Is that your topic? It was fun for me to adopt the topic. My „seeker“ is very clever as is generally known but in spite of his recognized knowledge he obviously seeks in the wrong place. Or the experiments for example something merely with regard to the buyers: in the newspapers of the series „Fische“ (“fish”) I hide messages that only the buyer of the painting will be able to decrypt. Before I even begin with the painting he has to tell me what is written in the newspaper. Often I don’t understand it myself. The actual topic, the fish, is completely uninteresting – we have to read the newspapers if we want to understand. But most of the paintings will simply evade any form of explanation. Language unlike painting has a limited diversity of expression, so if you want to explain art you’re bound to fail. AHC: Which meaning, apart from visual arts, has culture for you - Literature, philosophy, music, theater? Do you find inspiration in these areas? Or do you develop your ideas by going into the cloister like a monk? Recently I read more about quantum physics, the remarkable Stephen Hawking, but also Brian Greens „The Elegant Universe “ or Feynmans „The Character of Physical Law“ – besides my daily imperatives concerning law. I try to stay updated in literature but I can’t fulfill my own standards. I hate music since I know that for a good performance an instrument requires the whole time of a man. I will never play the guitar again because in any other point of my life I played better than today. Theater – how do you even spell it? I am mono gifted and mono educated, that is the bitter truth. AHC: You live near Konstanz at the Lake Constance. Can you tell me anything about the local art scene? No, not really. The local art scene doesn’t know me, neither the town of Konstanz nor the cultural office of Allensbach, or the important gallery owners or other local cultural protagonists. Neither of the aforementioned have recognized me or even reacted on my initial endearing letters with the request for exhibition space when I finally had created enough paintings. Due to this I am very pleased about non artistic protagonists like the notary’s office of Konstanz which gives me the opportunity of a permanent exhibition over three entire floors in the Rheingasse 20 in Konstanz. The ‘location’ is from the perspective of the 1st art market very antideterministic. (grins). Before the paintings go into the world they all hang here. AHC: What are your plans in art. Where does the journey go? Eckhard Besuden: Well, do I have to figure out everything myself? AHC: Thank you very much, Mr. Besuden, for the invitation to this interview and all the best for future projects and exhibitions.